According to statistics from the National Institutes of Health, about one in 20 people suffer from rosacea—around 13 million total. A chronic skin disorder, rosacea can occur on the face, neck, chest, scalp, or ears, where it causes redness, and small, pus-filled bumps. The condition can be frustrating, flaring up when you least expect it to cause embarrassment and an unwanted dip in self-confidence. Though rosacea can’t be cured, there are steps you can take to reduce flare-ups and encourage more healthy, vibrant skin. Rosacea redness can be irritating and embarrassing. Try some of these potential solutions. Dermatologists still don’t know what causes rosacea, but they believe it has something to do with hereditary and environmental factors. The immune system may also be to blame, as it may cause an unnecessary reaction, similar to an allergic response. Whatever triggers the condition, it is progressive, meaning that it can continue to get worse over time if it’s not treated. Characterized by “flare-ups,” rosacea may appear on the skin for a few weeks, then disappear for a period of time, then come back again. 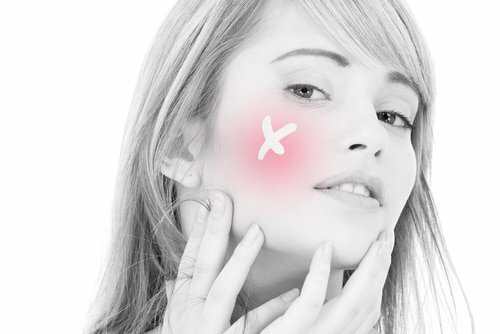 Women over 30 years old and those with fair skin are most at risk, though men, when they have rosacea, typically experience more severe symptoms. As it progresses, rosacea can also cause eye irritation, burning and stinging skin, dry skin, swelling, thickened skin, raised red patches (plaques), a large red nose, and a spreading of these symptoms to the neck, chest, scalp, and ears. Rosacea is typically associated with certain “triggers” that can very from person to person. Coming in contact with these triggers can encourage a flare-up. Figuring out which triggers apply to you can help you adjust your lifestyle to avoid situations that cause your skin to react. In summary, avoid anything that makes you blush to tame the symptoms of rosacea. Protect: This is one the best things you can do for your skin. Protect it from the sun and other weather elements with hats, scarves, and a safe sunscreen, and stay indoors during peak sunlight hours of 10:00 a.m. to 3:00 p.m. Calm: Try new ways to deal with stress. Work a daily meditation into your routine, or try yoga, tai chi, long walks, or listening to calming music. When you feel stressed, try deep breathing techniques to calm down. Eat healthy: Your skin reacts to what you eat, so avoid those foods that trigger flare-ups (like spicy and hot foods), and choose items that will help tame inflammation, like whole grains, almonds, and dark, leafy greens. Add fresh fruits for antioxidant protection, and cold-water fish for the moisturizing omega-3 fatty acids. Note: Make sure you don’t have food allergies, as sometimes these can manifest as skin redness. Check with your allergist, and try avoiding corn, eggs, and/or wheat for a few weeks—these are common allergens in people with rosacea. Choose non-irritating skin care: Your skin care products can cause flare-ups if they contain harsh chemicals, sulfates, preservatives, and other similar ingredients. Change your pillowcase: It can trap dirt and oils, encouraging your skin to react. Change your pillowcase every other night, and choose white cotton material rather than synthetic fibers, which can aggravate the condition. Supplements: Try 100 mg a day of alpha-lipoic acid, and 60 mg a day of CoQ10 to help reduce inflammation in the body—and in the skin. A study published in the International Journal of Dermatology also found that 100 mg of zinc sulfate three times a day helped reduce rosacea symptoms. Do you have other tips for taming rosacea? Please share them! According to the Medical Medium Anthony William, Rosacea is actually a form of Exema and the cause is toxin overload in the liver. A healthy diet is key. I have cleaned up my diet and while I haven’t yet reduced the appearance of mine yet, it at least has stopped progressing. It takes time!